Today we get another one of these intriguing match-ups between a Biblical figure and a 20th-century theologian and martyr. The last time one of Jesus’ inner circle appeared in Lent Madness, Thomas went down to defeat at the hands of Enmegahbowh. Will James, this “Son of Thunder,” survive or will he be struck down by Bonhoefer’s lightning? In yesterday’s oedipal action, Monnica (mom) defeated Augustine (son) 56% to 44%. Therapy will ensue. Check out the updated bracket and, if you’re wondering about upcoming matches, view the complete calendar. James was one of Jesus’ three disciples who formed the inner circle within the twelve. Along with his (probably younger) brother John and Peter, James witnessed the Transfiguration and the raising of Jairus’s daughter. He also fell asleep several times when he was supposed to be up watching and waiting while Jesus was agonizing in the garden before his arrest. Jesus gave this inner circle of disciples names that would now be appropriate for modern wrestlers. Peter was nicknamed “The Rock,” and James and John were “The Sons of Thunder” (good for a tag team bout, yes?). This nickname probably came from their quick tempers, which may have led to James being the first of the twelve to be martyred. The Acts of the Apostles records: “About that time King Herod laid violent hands upon some who belonged to the church. He had James, the brother of John, killed with the sword” (12:1-2). While James (known as “the Greater” to distinguish him from the other men named James), has a prime place among the disciples, he has very little dialogue in the Gospel to show for it. Nowhere does James say anything by himself, and only in a few places do he and John speak together. Rather than taking the role of voice as does Peter, James’ primary role seems to be one of witness and friend. One of the four original fishermen, James was among the first to leave the fishing nets and follow Jesus, meaning he was around for the entirety of Jesus’ public ministry. The tradition surrounding James says that his body found its way to Spain (where some dubious accounts say he ministered before his beheading), where he became a patron saint. In Spain, he is known as Saint Iago, whence comes the name “Santiago.” Saint James’ shrine in Compostela has been one of Christendom’s most important sites of pilgrimage for well over a thousand years. Collect for James the Apostle: O gracious God, we remember before you today your servant and apostle James, first among the Twelve to suffer martyrdom for the Name of Jesus Christ; and we pray that you will pour out upon the leaders of your Church that spirit of self-denying service by which alone they may have true authority among your people; through the same Jesus Christ our Lord, who lives and reigns with you and the Holy Spirit, one God, now and for ever. Amen. 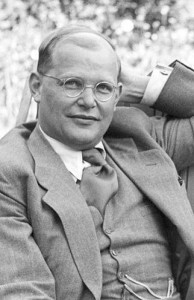 Dietrich Bonhoeffer (1906-1945) studied at the universities of Berlin and Tübingen and earned his doctorate in theology at the age of 21. He did postdoctoral work at Union Theological Seminary in New York City (1930-1931), arriving there one year after the stock market crash that signaled the beginning of the Great Depression. At the same time that he was seeing long lines of unemployed workers and the cardboard shacks of the homeless, his family was writing letters to him with news from Germany about growing unemployment and gains by the Nazi Party in recent elections. Bonhoeffer became good friends with an African-American seminarian named Frank Fisher, who introduced him to the African-American community in Harlem and the vibrant worship of its churches. The extent of racial discrimination and segregation in the United States was shocking to Bonhoeffer, whose oldest brother had declined an offer to teach at Harvard University because of it. Seeing things from below, from the perspective of those who suffer, would prove to be more relevant to his future at home than he could possibly have imagined at the time. He was ordained and eventually became a leader of the Confessing Church, comprised of German Christians opposed to the attempt of the Nazi Party to reshape Protestant Christianity in its own racist image. His books Life Together and The Cost of Discipleship, which have become spiritual classics, arose out of his experiences as the leader of an underground seminary from 1935 until the Gestapo closed it in 1937. He was executed at the Flossenbürg concentration camp only a month before Germany’s unconditional surrender at the end of Word War II. His final words to a fellow prisoner, “This is the end – for me the beginning of life,” were meant as a message to his dear friend George Bell, a bishop in the Church of England, who had received from Bonhoeffer the names of those involved in the plot to overthrow the Nazi regime in order to pass that information to the British government. Collect for Dietrich Bonhoeffer: Gracious God, the Beyond in the midst of our life, you gave grace to your servant Dietrich Bonhoeffer to know and to teach the truth as it is in Jesus Christ, and to bear the cost of following him: Grant that we, strengthened by his teaching and example, may receive your word and embrace its call with an undivided heart; through Jesus Christ our Savior, who lives and reigns with you and the Holy Spirit, one God, for ever and ever. Amen. 96 Comments to "James the Apostle vs. Dietrich Bonhoeffer"
Pretty much a no-brainer. Sorry, James. Bonhoeffer was actually imprisoned for his participation in Abwehr operations to rescue Jews. He was certainly aware of attempts to assassinate Hitler (there were at least 3) and had some share in planning earlier ones, but was already imprisoned before the final and most nearly successful one. His association with the plotters was the reason for his execution, however. Whether that makes him, or prevents him from being, a martyr is a matter of judgment. I would consider him one because he was acting on a conviction, based on his Christian faith, that Hitler and the war had to be stopped and he saw the elimination of Hitler as the route to both ends with the least harm to others. Although I have known of Bonhoeffer for many years it is only recently that I have been reading some of his work, and others about him — and the more of both that I see, the more I admire his example. Not to dis James, I have always been particularly impressed by his (pot-mortem) feats in Spain, but somehow that’s not quite enough in this contest. BTW, doesn’t everyone know that Thunder was the mother of James and John? i think it would be the father of james and john. Yes, he was just associated with those who plotted to take down Hitler but the whole time he was against taking life. He evaded being drafted to fight in the army, the reason for his imprisonment. It would not be surprising Boenhoeffer winning. He is so near our time. James so distant away the details of his ministries unknown to many and no written record. I am sure he did marvelous things edifying. A “martyr” is a spiritual athlete and witness for Christ. Bonhoeffer qualifies, hands down. Let him who is without sin throw the first stone. This one is tough. One of the “sons of thunder”, among the earliest of Christ’s followers, witness to the Transfiguration, requester of a ring-side seat in Heaven vs. a modern martyr, the witness against “cheap grace,” hero of opposition to oppression! Good Lord, how does one choose? I’m gonna go with Bonhoeffer because, frankly, his writings have been more formative of my spirituality and theology than the sparse biblical witness of James the Greater has been. (On the other hand, I went to college, first worked in the church, and went to law school in the American city named for James, San Diego, CA; maybe that should count for something …. but, no.) Dietrich Bonhoeffer it is! Was ordained in the Diocese of San Diego–but my priestly ordination was on the feast day of Dietrich Bonhoeffer, so I think that he would trump James for me for that reason alone. Plus his spirituality and his witness. others… besides, he was a fellow Bach-ophile! Bonhoeffer is really important in his theology of grace and his life of witness. Surely a Golden Halo (heavenly choir sings an impressive chord!). And normally this would be a no brainer for me. 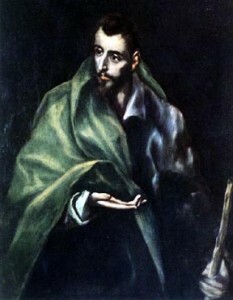 Except… the actual image used for James – the painting by El Greco – has had such a dramatic impact on my own life and spirituality. It was part of a “rebirth” for me. Bonhoeffer shows us the way! Yes, but Bonhoeffer became who he was because of Christ & his ‘Inner Circle’. Both men paid the ultimate sacrafice for their faith, but I think Bonhoeffer is closer to us on current issues & that’s why he’s getting all the votes. It takes a lot of guts to throw down your fishing nets & walk away from your own father to follow a guy many preceived to be a crackpot. That is a leap of faith. I gave my vote to the not so perfect, but completely devoted to Christ, James. Anyone who voted for St. Augustine out of pity because of his helicopter mother will definitely want to vote for James! I’m still thinking about this match. . . .
Too hard to choose for me! who decided these match-ups? Crying foul…. I agree! Foul play. And I suspect it will only get fouler as the weeks go by. It is hard when we know so little of James, though his faith and commitment seems clear enough. There is so much to continue to learn from Bonhoeffer, so much to admire in his radical discipleship, which encompassess struggle and doubt, so much to reach for, He has left us a rich mine to inspire and challenge. Thank you Dietrich. (from his prison cell in Berlin) who went on to bring down the East German Communist government; or his love of American Jazz and Gospel music, which gave heart to his brilliant theology: he taught us that the evil which made possible WW1 & 2 meant that we lived “in a world come of age”, that we single believers no longer needed a paternal church to tell us what God intended for us and how we should lead our lives. Our duty and salvation to our selves and each other was to look to the Cross and follow. Dietrich stood in the midst of the smoke, fire, and rubble of our world, pointing to Christ, and told us to lift our eyes, and “Look”. @ Don Cardwell… very nicely stated. I serve St. James Church where there is a stained glass window dedicated to Bonhoeffer. Nonetheless, I vote for Santiago. Tens of thousands have and still do vote with their feet and make the pilgrimage. I approached refreshing my memory through the bios thinking I was certain to vote for Bonhoeffer (and the current trend suggests that I would have been with the vast majority), but was swayed by Adam’s reference to James as “witness and friend,” as opposed to “voice.” The role of those who are “merely” with us–as opposed to busily saying and doing–tends, I think, to be underappreciated. I have been blessed with such people in my life and they have been absolutely indispensible in my formation. I just had to cast a vote for James, witness and friend to our Lord. Voted for the 20th century martyr. Bonhoeffer for me. No contest. He went against his own conscience to follow his conscience. Patron saint of complexity? Absolutely, Marguerite. Bonhoeffer’s struggle with his conscience is a reminder to us all that the way is not easy or simple. I for one really appreciate his struggle. We don’t even know if this James existed – so I might have voted for him to make him more “real” — but voted for Bonhoeffer – tho I think you are pumping him to win by putting him up against James. Sure, we wouldn’t know if James existed … if we had no faith in the Gospels whatsoever! Ann, we know James existed. We’ve read about his dramatic parents: Daddy Thunder & Mother Heliocopter. We’ve read about his astonished silence in the presence of Jesus’ Transfiguation. Why was James silent? First, he was awe struck and second, who could ever get a word in edgewise with Peter blurting out his instant thoughts. Though the Oxford Annotated Bible attributes the Letter of James to the brother of Jesus, I’d like to think James the Lesser was the author. At last, the poor, out-shouted man got to have his say. Probably the Oxford scholars are correct. Be that as it may, Helio-Mama demanding that both of her sons sit on either side of God in Heaven, is strongly indicative of the existence of her James and of her John, the sons of Papa Thunder. I’m voting for Bonhoeffer, I realize, because he seems more real to me than James. DB’s witness packs a powerful 20th century punch. James feels more distant, more like an icon than a real person. I don’t condone my “ageism” here, but it is what it is. James, though compelling, could have done no other having known Jesus in the flesh and having been greeted in person by the risen Lord. How could he do anything other than walk that path? Dietrich could have chosen another path 1900 years later but didn’t. For me he embodies Jesus’ teaching, “for those who lose their life for my sake and the sake of the Gospel, will save it.” He gets my vote. Yes, Greta. Thanks for this. I have set my feet on the pilgrim’s road to Santiago, and I’m leaving for Spain on April 29th for some 40 days of walking to the resting-place of James’ bones. How could I not vote for him? At the same time, I am torn by DB’s bravery and utter commitment to Christ. Such a tough matchup! Corry, All the best on your pilgrimage! I walked the Camino a few years ago, and it was a true spiritual experience. Keep your pack light!! Bonhoeffer it is. He has meant much to my life, especially when I served in Sudan. No cheap grace, no abandoning the Gospel, do what is right even when it will cost you immensely, prepare to humble yourself before God … His influence has led me down many paths I would have/could have avoided, except that I kept hearing his voice. I love James’ as a friend. I admire Bonhoeffer as a brave Christian. I have to go with the latter. Clear choice this time, Bonhoeffer all the way. He paid the “Cost of Discipleship” for his beliefs in a time when so many in Germany waffled before the power of the Reich. How important it must have been to have a trusted friend – that friend that dropped everything to follow when You called. How important it has been to have those have pointed the way to You. Both lost their lives to gain their lives. Both an example of who we are called to be. It sneaked up on my the last time I read the Acts of the Apostles. When I learned that James had been killed, I cried. I felt like a friend of mine had died. Now clearly it is no surprise that everyone who walked with Jesus has died, but somehow it hurt me to know that he had been killed. He is not more “important” than Bonhoeffer, but he is my friend. I don’t know why I like him so much, but then I’m not sure why I like any of my friends. I just do. I already voted but reading your testimony almost made me want to go back and vote again so I could vote for James. How inspiring that he can move you still from so long ago. Hard one. When I knew Bonhoeffer would be in a match was sure I would vote for him. But James as the first martyr won my vote as the one who set the example for all other martyrs that came after him, including Bonhoeffer. None of this of course is meant to diminsh the incredible example of Bonhoeffer who keeps alive a witness in modern day of the possiblity of a call to martyrdom. Two martyrs matched together always a hard one for me given my anabaptist heritage and linage that includes blood relatives martryed in the radical reformation, sadly also by other Christians. Hmm, maybe I should have voted for Bonhoeffer. Oh well, figured Bonhoeffer would win, so also a vote for the underdog. I was thinking just this morning that the category should be “saints and hero(ine)s of the church”. I admit I’m a little confused by your comment. In the Episcopal Church calendar, both of these folks are saints. I for one very much appreciate that the field is as open as it is. “Saints” need not refer only to the officially canonized. IMHO Ambrose Bierce is not wrong when he defines that kind of “saint” as “a dead sinner, revised and edited”…facetious, yes, but there’s an important point to be made about lionizing human beings buried in there somewhere. Suzanne, I was thinking like you were while reading. Bonhoeffer got my vote because he seemed so persistent. Yet, I saw alot of myself in James – falling asleep so many times, not necessarily speaking up right away……..you’re right. Two martyrs in a match isn’t easy. Still, Bonhoeffer got my vote. And I’ve been voting for underdogs til now so it’s nice to see I’m not getting stuck in a rut. I think we need the example of people from our own time to reinforce our understanding of the power of the Gospel. James was a wonderful man I have no doubt, but I wanted to recognize Bonhoeffer for his courage in opposing the Nazis. He chose to do Something when so many were doing Nothing. Thank you for Lenten Madness. It has led me to deep reflection. Daily. That, in itself, is a feat. I thought today’s match-up would be an easy click of the mouse. I decided with Thomas that he had already received the ultimate gold when he got to talk, eat with, and touch Christ in the flesh. He didn’t need anymore golden recognition from us. I was even less sympathetic with James, who brazenly requested that level of companionship for all eternity ahead of his peers. However, as in the Monnica/Augustine debate – would there have been a Dietrich Bonhoeffer struggling with the cost of discipleship if James and the others hadn’t dropped their nets? Why do I assume that following the embodied Christ was so obviously full of the Presence, compared to all of us who have struggled to follow since then without the tangibles? Who might be intersecting with my life right now who carries that Presence and bids me to pay attention? Everyone. Right? So I guess I better get off the computer and go do some intersecting. I am still voting for Bonhoeffer though. After reading all the comments, I am more clear. For me I realize the Bonhoeffer is “larger than life” and James is an ordinary person. I guess Bonhoeffer sets the bar too high for me to reach, but being a quiet friend who follows, that I can be. Someone said how can you have known Jesus and not followed. Well, I guess Judas might want to speak to that. Or the thousands who knew Him and did not respond. Okay, anyone with a blog called Prozac Monologues has to love the stone boat story, and even plan to walk 500 miles across northern Spain to see the dubious relics. But when Lent Madness is a fading memory, we will need the witness of Bonhoeffer for the spiritual crisis of our own age. We have NOT been saved from the time of trial. God grant that we meet it with such clarity and such discipleship. A striking comparison–that strange and mystical painting by El Greco and the picture of Bonhoefer looking like a self satisfied German burgher. I lean toward James because of the El Greco which seems to capture what we do not know about him but Bonhoefer seems more of a saint of our times. Good point about the images and I agree with what you say about the contrast. So after thinking about this now I wonder — is it more saintly to be/look miserable? Any points for joy? I struggle with Bonhoeffer’s attempted assassination of Hitler, and while I admire the call to costly discipleship and the need to face the really tough ethical questions, I keep hearing, ‘Those who take up the sword will die by the sword.’ I’m going to follow the thousands of Christians who have voted with their feet over the centuries on the way to Santiago de Compostela. It took as much courage for James to stand with Jesus – son of a carpenter, the strange prophet not accepted in his own hometown, who dined with outcasts, offended the powerful, and broke the Law as he deemed necessary – as is did for Bonhoeffer to stand up against the Nazi regime. And it was actually harder, I think, to be one of the first to say “I believe” than it was to hold fast to faith and Christian principles with 2000 years of scripture, history, and doctrine to support that belief – and in the face of such obvious evil. Both men today are inspiring witnesses to Christ, but since I can vote for only one, I chose James. Janet, you said it so well! Bonhoeffer was supported by centuries of Christianity in his valiant effort against evil, while James (good old James) threw everything into his choice to believe Jesus and serve God. Many of us today can really taste the vileness of the Nazis, and that makes us appreciate Bonhoeffer’s saintliness more easily; but centuries of pilgrims to Santiago attest to the goodness of James. James must not have known when he first joined with Jesus, he was at the foothills of his eternal life. The discovery of Resurrection came as he traveled with Christ. Bonhoeffer, however, lived with a face full of horror. Somehow, he was able to live and act knowing full well, these actions would certainly result in his mortal death. He gets my vote. Gosh, you write great comments! Janet certainly makes an important point. While both of today’s candidates lived out their faith and ultimately gave their lives because of their faith and beliefs there is an important difference between them. Dietrich Bonhoeffer had 2000 years of christianity to base his beliefs and faith upon. James only had faith. For that reason James gets my vote. “Only faith”??!! What about being a first-hand witness to Jesus’ teachings and miracles? ?And James had an in-his-face experience of the Risen Christ!! I hope and expect Bonhoeffer did too, finally..but not before he had to stake his life on it. For that, it has to be Bonhoeffer. I voted for Dietrich… then, I began to wonder if I had voted for him just because of his martyrdom in my own personal history. We have so much more a completed picture of the person in Bonhoeffer. James was however a pivotal instrument of the earthly mission Jesus of Nazareth. It seems a wee bit easier to vote for the one we know more about; where there is more historical fact than urban legend. I understand complexity, but in the end I couldn’t reconcile the decision to join in an assassination plot with Christianity. It’s hard, but non-violent opposition to evil is less likely to provoke violence in response, and even if it does, non-violence is the more Christ-like response. DB. Changed my life. Wish I had known him in real life. If I hadn’t already voted for him Don Cardwell’s post would have convinced me. These two would be two of my top four for Lent Madness, but ultimately it’s an easy decision. James is an APOSTLE! And I still don’t believe Jesus would have his disciples strike out. Bonhoeffer. Because he showed that ethical decision-making is often very, very hard. The problem is not following the rules in a particular situation. The problem is that in a particular situation there are rules that conflict. If I follow one, some good and some evil will happen. If I follow the other, the same thing. No matter what I do, something good will happen but something evil will also happen. Or I can sit in paralysis and do nothing at all. Which may result in more evil than choosing one way or the other. The “Bonhoeffer and Hitler” issue is probably one of the worst ethical decision-making places for anyone to ever be placed in. If Bonhoeffer participates in killing Hitler, he has violated the commandment against murder. He may also encourage others to commit murder where the ethical considerations are not so severe. On the other hand, thousands of lives will be saved. If he does not particulate in killing Hitler, he has not committed murder or “lived by the sword.” But thousands of people will die. He does evil either way – people will die. In his Ethics, I think he realizes that in this type of situation, he has to accept guilt for the evil that results from whatever decision he makes and to ask God for forgiveness. Would I have made the same decision? I don’t know. What I have learned from Bonhoeffer, however, is that moral decision making is oftentimes not easy because there’s no clear black and white answer. Instead, I have to choose between the lesser of two evils. And I have to accept that a choice of a lesser evil is still a choice of evil, for which I must accept guilt and ask for forgiveness. Bonhoeffer does it for me. James. The only apostle I’ve ever hugged. Metaxis book Bonhoeffer: Pastor, Martyr, Prophet, Spy; is just an excellent book on his family life, education, engagement to marry, ministry, theology and his dedication to God’s will is a good read. Wow! This kind of dilemma is what Lent is all about! Since I was confirmed in a church honoring St. James, and sponsored for ordination by another honoring St. James, the choice would seem obvious. However, to my mind this isn’t a competition between degrees of saintliness, but of influence in daily life. St. James is a misty figure, human-yes, but part of such a different world. Bonhoeffer, of whom I learned in my thirties, lived in a world very much like ours. He struggled with dilemmas that many of us struggle with, and though a modern person, he still died like an ancient saint. He gets my vote simply because I see him more clearly, and he always points to Christ. We have much more history written on Bonhoeffer, theologian and martyr, as well as his own writings. I think that’s why he’s so far ahead. Have you not considered that James, Son of Thunder, left his life and livelihood to follow Jesus, gave up self in every sense of the word. I vote for James the apostle. Thanks to everybody here; you are great company . @Marguerite — Yeah, I am posting my picks on Facebook for the winners in the saintly sixteen and going forward rounds, on March 15 — and encourage others to do the same. I mean, let’s really get into the bracket thing. I’ve got Dietrich vs. Mary Magdalene for the final. Paul could pull an upset, but my money says this is too Anglican a crowd. DECISIONS decisions decisions, This is a tough one, My first thought was James of course. I married James, My first Episcopal Church was St. James. My daughter was baptized at St. James Church. THen I did more research on this Bonhoeffer dude. To make the choices he made at such a time of turmoil. TO witness what he witnessed. But it comes right down to my faith in the beginning, James was there for so much. A first follower of Christ what that was the very unpopular stand to take and to die for it. I am going with James. I went with Thomas for the same beliefs. Is that right? After some deliberation, I cast my vote for David Donofrio, the 25 year old Democratic candidate for my State Rep, a real underdog, then went with the majority in Lent Madness today. I so love participating in the electoral process! What I also find very powerful about Bonhoeffer’s witness is his refusal to let Christianity be claimed and defined by those who would use it for destructive, exclusionary purposes. You can’t top being handpicked by Jesus. James was just an ordinary guy…a fisherman…one of twelve known mostly because of his appearance at the Transfiguration and for falling asleep at a most inappropriate time. Most of us are like him. We did not get(and probably will not) be getting a PhD at the age of 21 and won’t be plotting an assassination, no matter the target. Too bad James is losing in this contest but remember, he won the one that counts ! I cast my vote as a 21st century Christian for Dietrich Bonhoeffer. I find it difficult to vote against one of Jesus’ inner circle, but if one of the points of saintly living is to encourage others on the path, Bonhoeffer’s address to the circumstances of the 20th century provide me quite the vivid path to follow. My admiration, such a weak word it seems, for Bonhoeffer, will allow me to vote for no other. I’m sorry he wasn’t successful in his attempt on Hitler’s life. The world would have been a better place and less lives lost. Yes, Bonhoeffer was wonderful in many ways, though not all. But hey, I hiked 500 miles for Saint Jim! He gets my vote, even if he is way behind at this point in time! Dr primrose, thank you for naming so well the heart of the matter. I served at St. James’ and have always loved the arrogant impulsiveness (how very human!) of Zebedee’s thunderous sons…their mama, too…but DB has a different kind of intensity. May the Santiago pilgrims have safe, rich journeys, all, but my vote is for Bonhoeffer. Thanks to all of you for your depth and breadth of observation. I think that Bonhoeffer would have voted for James, and so would Spain. St. James certainly has my vote for his contribution as an Apostle of the early church. How long would it have taken for Christianity to travel if some of the Apostles had gone nowhere? We had a hard time tonight because, well, two-martyr competition. But Bonhoeffer prevailed with my young Episcopalians. Which is good because I would have used my veto power and voted for him anyway. Willa Goodfellow…yes…looking ahead I too can see a Magdelene v Bonhoeffer final. If that happens, I’ll be struggling with my decision. James, not a lot in the publcity department, but definitely a work-horse apostle. One of the first to follow Christ “without proof”, and to the end suffer a sword for his savior. Even with Santiago de Compostela many Christians don’t know that is James, the apostle of Christ. Bonhoeffer caught in the holy hell of situations, and he did what he thought was right, knowing it was the jumping out of a airplane and hoping the parachute would open… Who is more worthy? I bet they are BOTH hangin’ with JC right now and making it all right. Bonhoffer asserted his Christianity during one of the most, if not the most, horrific times of the 20th century. Hitler, & his extermination of the Jews, remains tragically near our own lifetimes. Tyrants and would-be tyrants litter history. Bonhoffer resisted a rather recent tyrant, knew the cost, and paid the price. Fell asleep – oh, what a blunder! At his strong faith we can only wonder. This brave Christian, a modern martyr. I’ve yet to read Bonhoeffer, and all I knew of him was learned in Education for Ministry. So, back to the Amazon wishlist for me! But, as I felt with Thomas, I find it difficult to vote against one of Jesus’ original apostles, so there it is. “Do you reaffirm your renunciation of evil and renew your commitment to Jesus Christ?” (Book of Common Prayer, p. 292). Dietrich Bonhoeffer has my vote. Thanks Ftr. Tim for including this holy man in LM. Bonheoffer’s “Christ The Center” brings together thoughts and words that have made clearer to me what Christ is in the world today. His ideas reach into my life and bring Christ to my world. “Even as the risen one, Jesus Christ remains the man Jesus in time and space. Because Jesus Christ is man, he is present in time and space; because Jesus Christ is God, he is eternally present.” “This body of Jesus Christ is not bound by space, but is present in all places at the same time, The transfigured body is present everywhere”. These are just two of the many ideas and thoughts found in the book. Bonheoffer’s thoughts and ideas are reflected in the actions he took in his life went he faced what Germany became in WWII. My vote is for Bonhoeffer.